Sadly I’ve never been to Mexico but it’s right up there near the top of my bucket list. When I make it there, this is the kind of food I picture myself eating, washed down of course with a bottle of ice cold cerveza. This black bean soup and chilli baked feta were two of the recipes I discovered through Kitchen Nomad, which unfortunately is no longer operating. I really rather liked this food box scheme, where each month ingredients from another mystery location would arrive on your doorstep along with recipe cards created by a well-known chef. Thomasina Miers provided the recipes for the Mexican month and these two dishes were our favourites, although my husband and I enjoyed them sin niños as the chilli would undoubtedly have proven a little two much for them both, even with their adventurous palates. The baked cheese should really feature a Mexican queso fresco but Miers recommends feta as a good alternative for this classic dish. 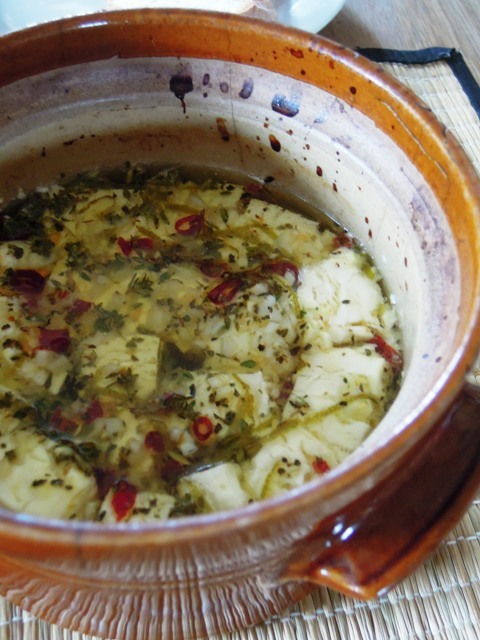 The feta tastes amazing melted into the olive oil and is brought alive by the flavours of garlic, lime, chilli and oregano. 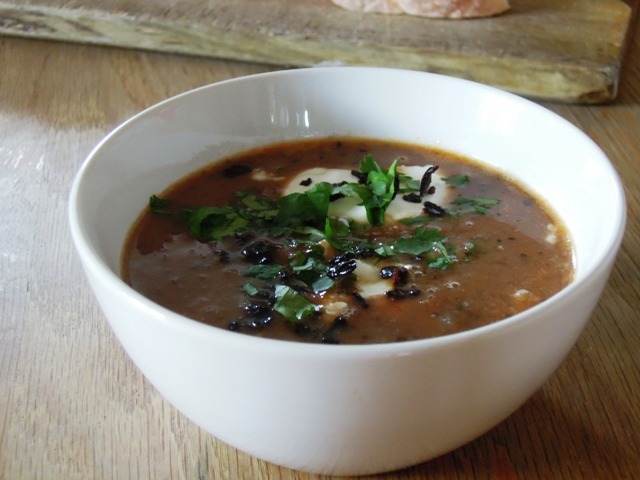 The black bean soup is sumptuously comforting, with a subtle and smoky warmth from the chipotle and ancho chillies, and it tastes extremely good with a dollop of soured cream and some of the chilli baked feta on top. Comer con gusto! Drain and slice the feta and place in an earthenware dish large enough to take the cheese in a single layer. Sprinkle the garlic, herbs and chillies over the top of the feta, together with the lime juice and zest. Then pour over the olive oil. Bake for 10 to 15 minutes, until the cheese is soft and squishy and smelling heavenly. Serve with crusty bread and black bean soup. Heat the butter and oil in a heavy-bottomed pan and when it starts to foam add the onion and herbs. Sweat gently for 10 minutes until the onion is soft. Add the tomatoes, garlic and chipotle sauce and cook gently for 5 minutes before adding the black beans. Cook for a few minutes before adding the stock and lime juice. Then simmer gently for 10 to 15 minutes. When cooked, whiz it up with a stick blender. Don’t go at it for too long as you want this soup to have a bit of texture. In a small frying pan, dry roast the ancho chillies for a few minutes until they start to smoke and then remove from the heat. Pour the soup into six warmed bowls and scatter over a little of your chilli baked feta with some chopped coriander, crumbled ancho chillies and a spoonful of soured cream. I’m entering these dishes into my Spice Trail challenge, which this month is heading to Mexico in search of delicious delights, and also into Cooking With Herbs hosted by Karen at Lavender & Lovage as they feature fresh coriander and dried oregano. This is my kind of food, love both of the recipes. didn’t know Kitchen Nomad was no longer around though, shame. That baked feta is calling for a very large bite. what a shame about kitchen nomad. 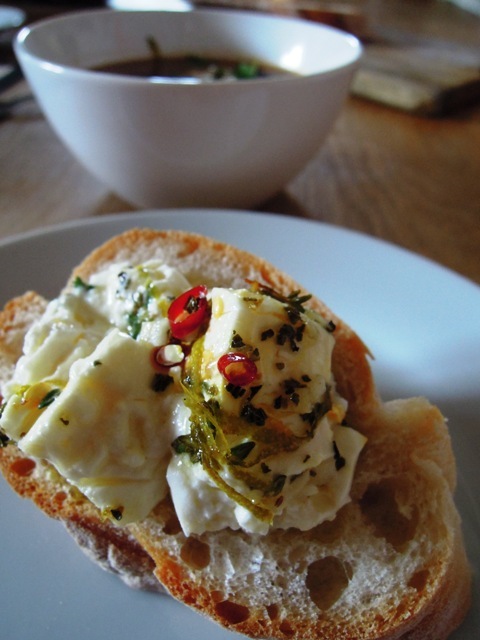 Do you know what happened to them And, I love the idea of the chilli feta! Sad, isn’t it? I really enjoyed receiving my monthly boxes. I got an email back in February saying their team is no longer living in the UK and so they were unable to continue. I love the sound of the chilli baked feta. Reminds me of the persian variant, naan-o-paneer, only your version is baked. Will definitely be trying this recipe. Yes please to both. Would never have thought of baking feta but now I’ve seen this recipe, it will be appearing on our dinner table shortly! An enormous yes please to both from me too! The baked feta looks totally to die for, and I’m sure would be stunning with good bread and ice cold beer. And the soup sounds equally as tasty, black beans really are all the rage suddenly aren’t they. Thanks so much Deena. I wish I could take the credit, but the recipe is totally Thomasina Miers – I didn’t have to play with it at all as it’s just so gorgeous!